Exciting news alert! 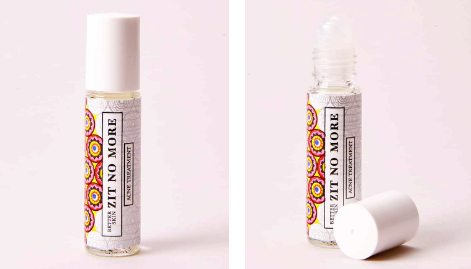 The indie beauty brand The Better Skin Co.'s super strength zit zapper ZIT NO MORE is now available on RileyRose.com and Riley Rose stores nationwide. I often get breakouts right before my time of the month, when my skin tends to be more oily. Having a tube of Zit No More on hand is a true life saver! All I do is roll a bit of this miracle solution over my zit a few times a day, and by the next, my zit is gone! I love it! Roll over those unsightly visitors and watch the magic begin. This wonder potion contains salicylic acid wrapped in three soothing essential oils. Dry up pore-offending criminals while nature’s warriors sooth and work hard to better your skin. The formula is boosted with PhytoVie® pollution defense to assist the skin with its battle against pollutants. Results can be fast and your friends may never know you had any skin troubles at all. 1. Clean the skin thoroughly before applying this product. 2. Cover the entire affected area with a thin layer one to three times daily. 3. Because excessive drying of the skin may occur, start with one application daily, then gradually increase to two to three time daily if needed or as directed by a doctor. Salicylic acid, Melaleuca Alternifolia (Tea Tree) Leaf Oil, Rosa Canina (Rose Hip) Fruit Oil, Brassica Campestris (Tung Wood)/Aleurites Fordi Oil Copolymer (Rapeseed Oil), Tocopheryl Acetate (Vitamin E Acetate), Aniba Rosodora (Rosewood) Wood Oil. The Better Skin Co., was founded in 2015 by trained aesthetician Natalya Rachkova and beauty industry veteran Murphy Bishop, II. Before becoming a sought-after skin care brand, The Better Skin Co., started as a recipe, brought by Natalya from her home of Uzbekistan to her new home of Seattle, Washington. Once settled in America, Natalya began making her miracle cream in small batches, and soon word of mouth spread. To keep with the demand, she partnered with Bishop. Bishop brought with him a reputation of success as well as a team of chemists that scientifically advanced the formula. Today, The Better Skin Co. blends the best of Natalya’s Uzbekistan upbringing with the technological advancements of science. Zit No More can be found at RileyRose.com! Nice Post. thank you for sharing. i am from roadrunner technical support team if any one of you facing any problem related to Roadrunner Password reset then call our technical support team at +1-888-338-6033. I am looking forward to more stories from you. Your writing and language is, of course, brilliant and remarkable. I wish you all the best for your endeavors. I have read many other posts likes this but this is something really unique from other posts. I don't like to make comments on every posts I visit but thought of dropping few words here. Update more information like this and surely you will get more readers and followers. Wow, such a useful post. Actually, I am fed up with all the beauty products used to reduce my pimples. I love all food so much and I can't avoid them. So I started it trying beauty products to reduce oiliness. I have read about this product in http://www.myassignmentwriting.com.au/best-essay-writers-in-australia/ writing services and I think this might help me to get out of my pimples and my dull skin.